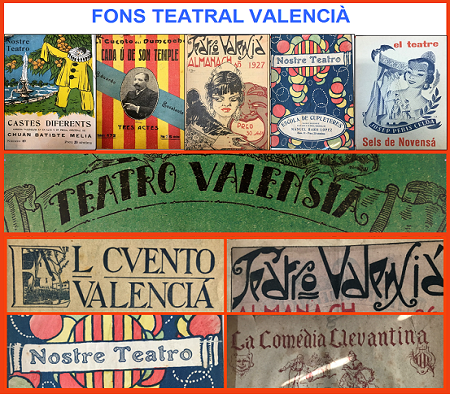 The Arts Library offers the section Fons teatral valencià that gathers sort popular plays Valencian of the 19th and 20th centuries. These pieces, designated traditionally like "sainet", "sainet fester (foguerer or faller) proceed of the purchase by the own University Library , Catalan Studies Department and the Inter-University lnstitut of Valencian Studies (IIFV) , as well as of donations and bequeathed of distinct nature. The purpose to constitute this collection is to turn into a point of reference for the study of the popular theatre Valencian of the 19th and 20th centuries as well as avoid the dispersion of the materials identified until the moment. This section completes undoubtedly with the access to the database Teatre popular valencià ( in his version wiki ) elaborated by a group of researchers linked to the University of Alicante (Jaume Lloret Esquerdo and Francesc A. Reus) under the direction of the professor Gabriel Sansano ( biel@ua.es ). Also the Fons Teatral Valencià has been enriched with other funds of theatrical nature from the second half of the 20th century. This set comes from various donations: Paco and Maruja Hernández, Ali Andreu Cremades, Vicent Broseta, Tadeo Fullana, Jaume Lloret, Gabriel Sansano, Ernest Pastor and Manuel Carceller Safont.